But this has changed since last quarter of 2013. 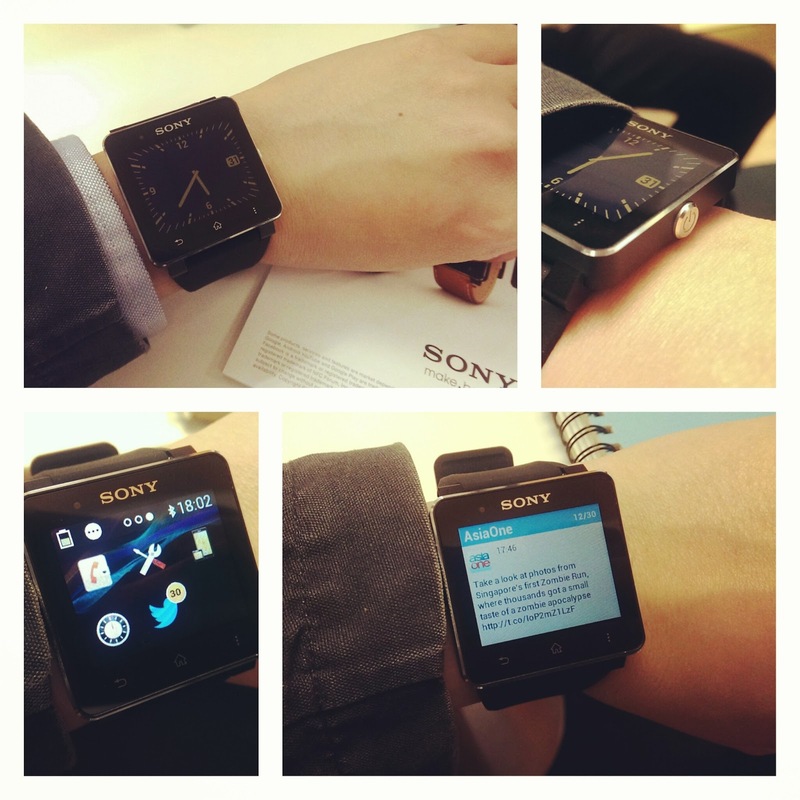 The biggest consumer brands – Sony and Samsung – have both launched smartwatches and available for retail purchase in Singapore. I have both smartwatches for review and here’s a review on the Sony SW2 (the Samsung Gear will be published in a few days time). On-screen, there are 3 soft buttons below the touch screen – back, home and menu – just like Android. During standby, the watch face is constantly visible even without backlight. 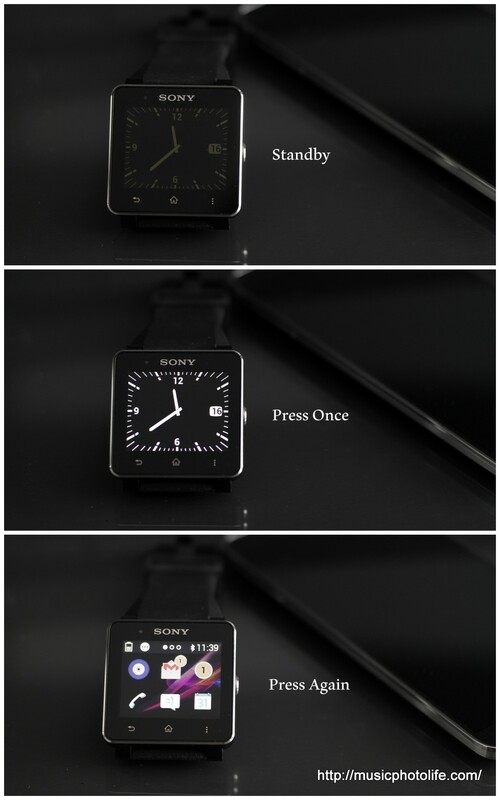 One press on the power button will turn on the backlight to let you see the watch face in the dark. 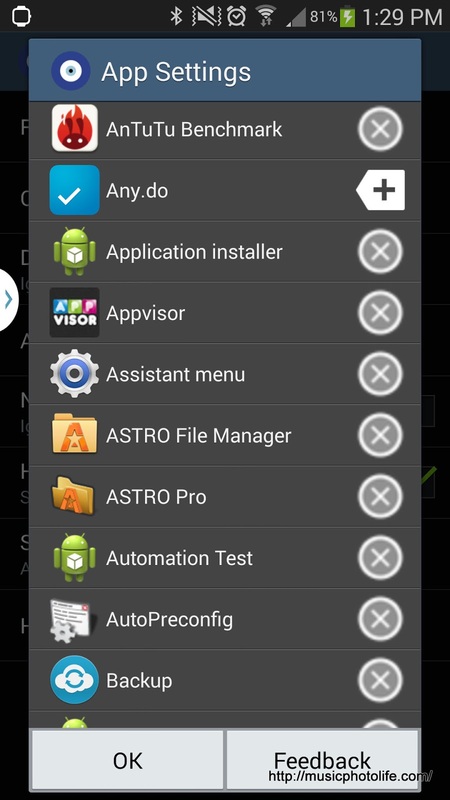 Another press will open up the “home screen” which looks just like Android: a status bar on top and a 3×2 icon page. Swipe left and right to access the other pages, swipe down for notification list, tap “menu” button for context options, “back” button to go back to previous screen, or “home” button to jump right back to the main homescreen. Any Android user will be able to operate the SW2 within minutes. The SW2 has a 220×176 pixel 1.6-inch colour screen. The resolution and images appear pixelated, the fonts, icons and images are not quite pretty. Compared to Samsung Gear, the SW2 screen certainly looks inferior and unimpressive. However, I am able to accept that because I value the functionality more than the screen quality. 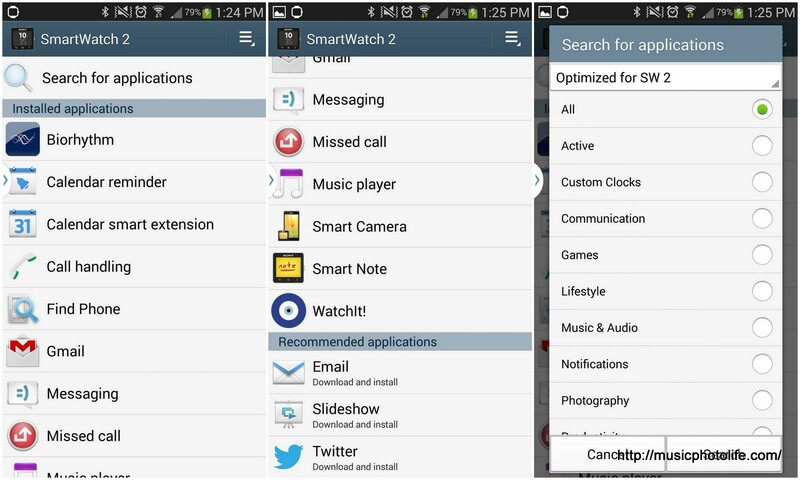 My favourite app is “WatchIt!“, a free app that allows you to configure any notification to appear on the SW2. This alone makes SW2 so much more useful, since the primary function of a smartwatch is to notify you of events on your smartphone. And interestingly, I can clear my WatchIt notification list, which means this is a feature that is not difficult to implement. I do hope the Sony-recommended apps could do just that. 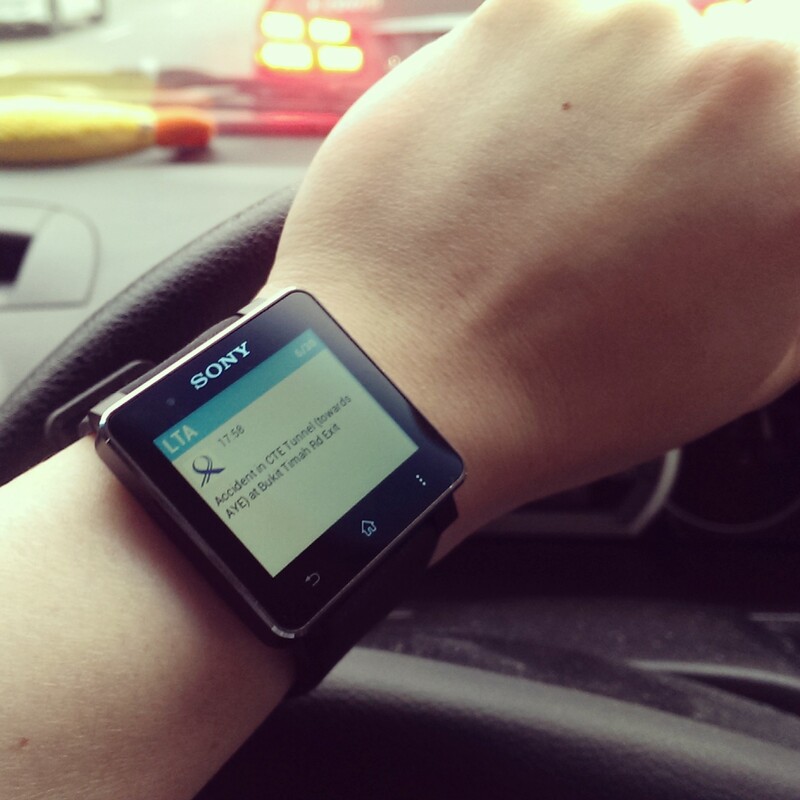 There are other apps that basically demonstrate the potential of smartwatches, but otherwise I don’t find them particularly useful. The Call app lets you search contacts, make calls via the keypad, but again it would be more efficient to seach contacts and dial a caller directly from the smartphone – unless you are using a Bluetooth headset, with which you can use the SW2 to make calls without touching your smartphone. The Twitter and Facebook apps displays only the latest 30 notifications on the SW2, and even if you scroll to the end of the 30 events, you cannot read more. You can also set update intervals but live notification is not an option. Anyway, I don’t find these social apps useful to display on the SW2. If required, I could use WatchIt! to push notifications of my social apps, including Instagram, Line, WeChat, anything! Above all the functionality, the SW2 has a long battery life. It lasts me about 3 days of normal office usage – mileage varies depending on the intensiveness. If you don’t use it that often, I reckon it can last up to a week. Amazingly, the SW2 has no observable impact on the battery drain of the smartphone. What I like about the SW2 is that it is unobtrusive, feels and looks like a normal digital watch, and displays the time without having to press any buttons to wake up the screen. I’m not going lie and proclaim that the SW2 is a classy timepiece, but I’m sure in time to come (no pun intended), with a sizable market, Sony will come up with design variants to meet the demanding consumers. 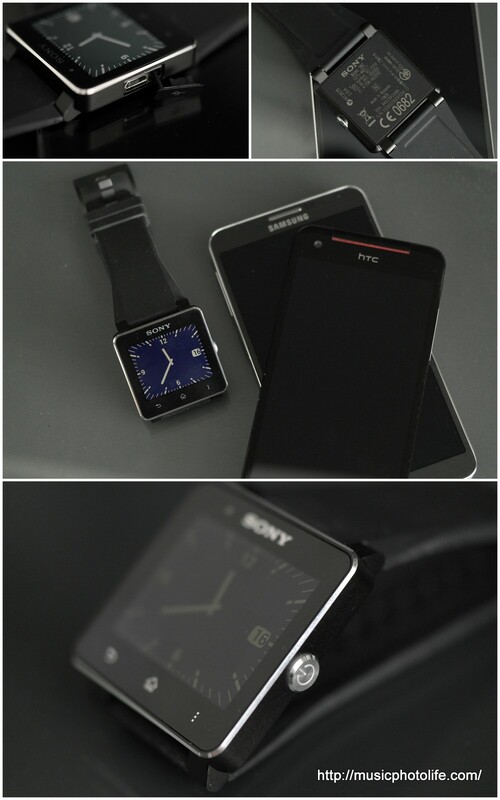 Pingback: Watch-Looking Smartwatches Are Here – Music.Photo.Life.